In working with our clients, we do not take a one-size-fits-all approach. We believe, through research, that a long-term holistic approach to ensuring organisational objectives are understood, embodied and delivered is more sustainable. 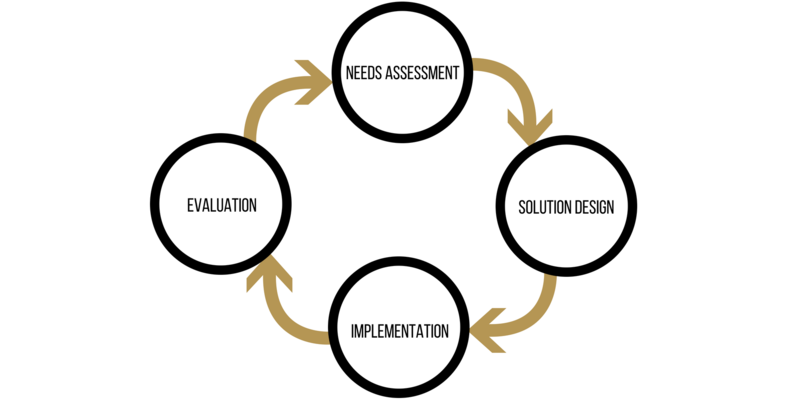 We take a 4-step approach to delivering the solutions our clients need. Depending on objectives, priorities and agreement, duration of service will vary from client to client. We therefore always begin the process with a consultation before moving forward. Please get in touch with us for more information. We always begin with a consultation with the key decision-maker(s) in order to assess needs and prioritise goals based on the global vision. This is followed by a proposal based on needs and priorities discussed with the key decision-makers. The proposal can be tabled during the consultation or after, if additional information is required. Upon signing of term sheets, work will begin. Because every organisation is unique in its operations and needs, strategy design and implementation as well as duration of work will vary. We carry out ongoing reviews for the duration of the work. We also keep the key decision-makers in the loop through executive debriefs and reports to ensure organisational objectives are being achieved.